Honda showcased a total of 11 models ranging from commuters to high-performance motorcycles at the expo. One of these models that garnered a lot of attention was the CBR 1000R Fireblade SP. So what's new with the litre-class track tamer? For starters, the motorcycle is a kilo lighter, at 195kg. It is also the company's first motorcycle to come with a lithium-ion battery. On the feature front it includes Honda Selectable Torque Control, selectable engine brake and five different riding modes. Powering the updated Fireblade is a 999cc inline four, liquid-cooled DOHC engine. This unit makes 191.7PS of power at 13,000rpm and 114Nm of torque at 11,000rpm. Transmission is mated to a 6-speed gearbox, which is aided by a quickshifter with a slipper clutch. With the current CBR1000RR SP priced at Rs 21.22 lakh (ex-showroom Delhi), we are expecting a bump of around Rs 4-5 lakh for the updated model. Japanese automaker Suzuki unveiled the 2018 version of the GSX-R1000R at the Auto Expo 2018. However, the changes are only limited to a new white paint scheme with blue stripes and a matte black paint with blue graphics, for the upcoming year. As before, the bike packs a slew of modern electronic accessories such as Inertia Measurement Unit (IMU), S-DMS adjustable power output with different mapping and engine power delivery system and Suzuki's 10-level traction control. It also features a bi-directional quick shifter and launch control system for optimising torque delivery. Powering the GSX-R1000R is a 999.8cc, 4-cylinder, liquid-cooled, fuel-injected engine. This powerplant produces a whopping 202PS of power at 13,200rpm and 117.6Nm of torque at 10,800rpm, mated to a slipper clutch-enabled 6-speed gearbox. Suzuki has equipped the engine with a MotoGP-derived Suzuki Racing Variable Valve Timing (SR-VVT) system where fuel is fed to the engine via fuel injectors which are actuated by a ride-by-wire throttle. Suspension duties are handled by adjustable Showa Balance Free Front forks at the front and a Showa Balance Free Rear Cushion Lite rear shock absorber. Braking is taken care of by a Brembo dual 320mm disc at the front and a Nissin 220mm single disc at the rear. While the pricing details have not been revealed yet, we are expecting the bike to be launched in the next few months. It competes against other litre-class superbikes such as the Yamaha R1, Honda CBR1000RR Fireblade and the Kawasaki Ninja ZX-10R. After launching the motorcycle in India in December last year, the Japanese brand showcased the 2018 version of the Yamaha R1 at Auto Expo 2018. It remains largely unchanged except for some additional features like a new quick shift system for seamless up and downshifts and a remapped lift control system which prevents the front wheel from lifting off the ground. Some of its other features include a 6-axis IMU, power mode, traction control system, slide control system and a launch control system. Powering the motorcycle is a 998cc, crossplane, 4-cylinder, 4-valve engine which develops 203PS of power without ram air pressurization at 13,500rpm and a peak torque of 112.4Nm of torque at 11,500rpm. The R1 uses a Deltabox frame which is suspended upon 43mm USD forks at the front and a link-type monoshock at the rear. Braking duties are handled by dual 320mm discs at the front with radial callipers and a single 220mm rear disc, with angle-sensitive ABS. Offered in two colours - blue and black, the 2018 Yamaha R1 is priced at Rs 20.73 lakh (ex-showroom Delhi). The Emflux Model One is special for two reasons. Firstly, it is an all-electric superbike, and secondly, it is made by an Indian startup. The entire bike has been designed and built from the ground up in India. The Emflux Model One is aggressively styled along the lines of a superbike. If edgy futuristic design was the theme here, Emflux has nailed it with the Model One. It does faintly remind us of the KTM RC8. Maybe a white and orange paint job would have us convinced. Powering it is a 60kW liquid-cooled AC induction motor which makes 81.5PS of power and 84Nm of torque at 8,400rpm. Claimed 0-100kmph is just 3 seconds and top speed is 200kmph. Superbike levels of performance comes with superbike levels of kit. It gets a tubular steel trellis frame suspended on 43mm front USD forks (upgradable to Ohlins Race and Track USD forks) and a gas-charged rear monoshock (upgradable to Ohlins 46mm gas-charged monoshock). Braking is via dual 300mm Brembo discs at the front and a single 220mm rear with a dual-channel ABS setup as standard. The Model One will be launching in 2019, with a price tag between Rs 5 - 6 lakh. While we wait for the 2018 BMW S1000RR to make its official debut, the company showcased the current ongoing version of its apex predator at the Auto Expo 2018. The motorcycle sports a quirky styling, with twin asymmetrical headlamps at the front that makes it stand out from the crowd. 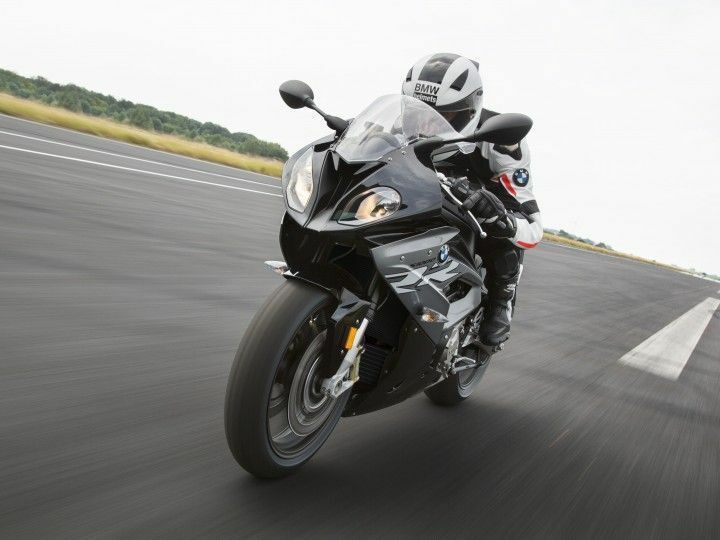 Some of its features include dynamic traction control, three riding modes, cornering ABS, launch control, wheelie control and pit lane speed limiter. In addition to this, you also get BMW's Shift Assist Pro which lets you perform clutchless up and downshifts. Powering the S1000RR is a 999cc, inline four-cylinder engine that puts out 199PS of power at 13500rpm and 113Nm of torque at 10500rpm. Its throttle butterfly valves are electronically controlled and it also features a ride-by-wire throttle. Suspension duties are handled by 46mm USD forks at the front and a rear monoshock unit, while braking is handled by dual 320mm discs at the front and a single 220mm disc brake at the back. The S1000RR is available in two different trims - the standard trim which retails for Rs 18.9 lakh and the Pro trim which costs Rs 21.4 lakh (ex-showroom Delhi). Kawasaki's pavilion was graced by the Ninja ZX-10R at the Auto Expo 2018. One of the most capable litre-class motorcycles out there, the ZX-10R receives no cosmetic or mechanical update for the year. Some of its features include launch control, sports traction control, engine braking control, a quickshifter (upshifts only), Kawasaki's corner management function and ABS. Powering the motorcycle is a 998cc, 4-cylinder, liquid-cooled engine which makes 200PS of power at 13000rpm and 113.5Nm of torque at 11500rpm, mated to a 6-speed gearbox. It uses a twin-spar cast aluminium frame which is suspended upon 43mm USD forks at the front and a gas-charged shock at the back. Braking duties here are handled by Brembo dual 330mm discs at the front and a single 220mm disc at the rear. Kawasaki currently retails the motorcycle for Rs 18.80 lakh (ex-showroom Delhi). Share your experiences with CBR1000RR?